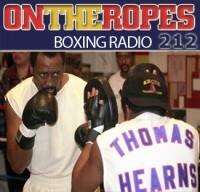 “On the Ropes” Boxing Radio returns this week with it’s 232th edition to talk about all the recent fight action going on in the sport. On this show I will be recapping last weekends’ Premier Boxing Champions card which featured a light heavyweight title match between WBC/RING champion, Adonis Stevenson and Sakio ‘The Scorpion’ Bika. Additionally, I will be discussing the undercard bout in which the hard hitting Artur Beterbiev squared off with veteran contender, Gabriel Campillo. Lastly, I will be previewing next Saturday’s PBC event, which features two title bouts, as Danny Garcia defends his light welterweight title against Lamont Peterson and Peter Quillin squares off with middleweight champ, Andy Lee. Just click on the audio player to listen to the show! Making his debut appearance to ‘On The Ropes’ is undefeated light heavyweight, Sullivan Barrera. The decorated Cuban Olympian is climbing through the ranks of the light heavyweight division and has his sights set on capturing a world title belt. Sullivan talks about his last win over the former IBF champ, Jeff Lacy and what he hopes to accomplish after this bout. Barrera also gives his thoughts on training under Abel Sanchez and working alongside middleweight champ, Gennady Golovkin. Lastly, Sullivan Barrera speaks about the top fighters in the light heavyweight division and gives his thoughts on the upcoming Mayweather vs. Pacquiao match. 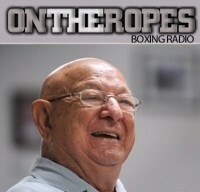 The second guest on this episode is renowned trainer, Ronnie Shields. Shields talks about Jermell Charlo’s recent win over Vanes Martirosyan and how he rates his performance in the ring. Ronnie Shields also gives his analysis of Floyd Mayweather’s upcoming bout with Manny Pacquiao and gives his thoughts on who he thinks will emerge victorious on May 2nd. 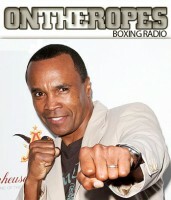 Ronnie also gives an update on his current stable of fighters. 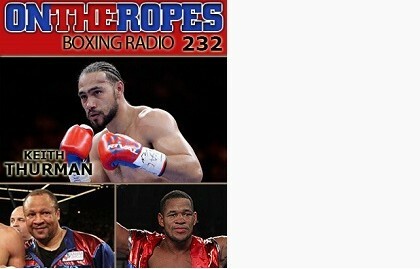 The main guest on this edition of “On The Ropes” is WBA welterweight champ, Keith ‘One Time’ Thurman. Keith is one of the most dangerous fighters in the welterweight division and is aiming to become the top fighter in the weight class. Keith talks about his impressive win over Robert Guerrero in the inaugural Premier Boxing Champions event. Thurman also speaks about potential future opponents for him and gives his views on the upcoming Mayweather-Pacquiao fight. The future of featherweight Gary Russell Jr.
3 Responses to "Keith Thurman on latest win & possible Kell Brook bout. 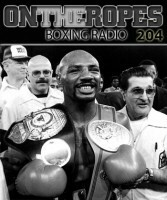 Also featuring guests Ronnie Shields & Sullivan Barrera – OTR #232"
they MUST ENFORCE QUEENSBURY RULE #2 – NO WRESTLING OR HUGGING ALLOWED, or its permutations grab, hold, snag or clinch. it is the rule that most apply to floyd the slick boxer CLINCHER – HUGGER. it is the ONLY WAY FLOYD WINS in this game of TAG where pacquiao chases him all night to stagger, bust and lump-up his face each time he connects as floyd runs, slips and slides to deliver his pitty pat (don’t really hurt nobody) counters to run up points and then grabs and hugs his opponent at the slightest sign of trouble EN DEN these dishonest referees (don’t forget “i’m fair but i’m firm” joe cortez also) doesn’t warn and much less deduct points from floyd’s repeated violations. IT’S A FARCE !!! Note these 3 guys won’t even instruct the combatants to “punch out!! 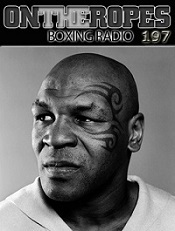 !” whenever floyd is in the fight, they just want to reestablish SAFE distance between ploy and his opponent. check it out. it is not right that a fighter chases after a runner all night and when he finally catches up to deliver mayhem is frustrated by the other’s dirty trick of hugging. you gotta be a stupid or a dirty referee if you don’t see that. I totally agreed to the anonymous comment about Referres protection of Floyd than being fair in their job in every Floyd’s fight.. It was so obvious in their previous fight assignments in every Floyd’s fight..
Bayless and Weeks are the two who favors Floyd every time. There should be a review board to scrutinize their performance especially a Championship fights. Sometimes it’s laughable how they accommodate Floyds antics in the ring perfect example is when Floyd complained that he was beaten by Maidana when the Referee sees nothing nor a holes that substantiate the cry foul of Floyd.. Such a girl or a crying baby.